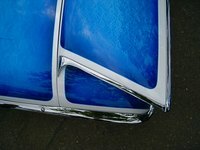 Urethane paint is typically used for painting automobiles or other metal surfaces. Many urethane paints are applied in several stages, with each layer of paint requiring sanding and a clear-coat. Single-stage urethane paint saves you time by combining gloss with a thicker urethane resin for quick coverage in one stage. However, single-stage urethane paint is often too thick to mist properly in a spray gun. If you want to use an airless spray gun with single-stage urethane paint, you'll need to reduce the paint. To thin urethane paint, you must have accurate measurements and the right thinning agent. Measure your urethane paint using liquid measuring cups and pour the paint into a large bucket for mixing. Measure urethane paint thinner based on your ideal thinning ratio. Urethane thinner is available at most hardware stores. Many spray gun user manuals provide recommended thinning ratios for urethane paints. If you do not know the appropriate thinning ratio then start with a small reduction percentage, such as 5 percent, and gradually add more thinner after testing the initial 5 percent dilution. The calculations for measuring your thinner involve simple multiplication. For example, 1 gallon of paint is 128 liquid oz. If you want to dilute a gallon of single-stage urethane paint by 5 percent then you'll need to multiply 0.05 by 128. The result is 6.4, so you should measure 6.4 liquid oz. of thinner. Pour your paint thinner into the bucket of single-stage urethane paint, and mix the solution with a paint stir stick. Mix for at least 5 minutes. Pour your reduced paint into a spray gun and test the mixture on a piece of scrap. If the paint is still too thick, pour it back into the bucket and add more urethane paint thinner until you get the desired result.